When Infrastructure NSW suggested the state government build a rapid bus transit (BRT) tunnel underneath the Sydney CBD, it caught most people following the issue by surprise. The idea, still embryonic, has not been looked at in detail, and lacks any form of substantial feasibility study – unlike the idea of putting light rail along George St which the BRT tunnel is meant to replace. These two projects have now been pitted against each other, with a meeting of cabinet this week expected to determine which one will be funded and built by the government. But are these two projects mutually exclusive? A recent meeting at the Sydney Town Hall hosted by Lord Mayor Clover Moore suggested that this was an either/or situation. This meeting was almost unanimous in its support for light rail, a view shared by the Sydney Morning Herald, but not Heath Aston, the state political editor of its sister publication the Sun Herald, who decided to back the BRT tunnel. The two actually serve different corridors through the CBD: the BRT tunnel will link buses that enter the CBD from the Anzac and Harbour Bridges which run along the Western corridor of York and Clarence Streets, while light rail would replace buses from the Eastern Suburbs that predominantly use the Central and Eastern corridors of George and Elizabeth Streets. (It’s true that the BRT tunnel will also take buses from Broadway, via George St, but this will require them to be re-routed from Circular Quay in the East to Wynyard to the West.) So it can’t be for that reason. The actual reason appears to have more to do with budgetary constraints. With each project estimated to cost $1bn-$2bn (depending on what assumptions are used), the government is likely to only have the cash to build one of the two, and that is the reason why this is an either/or situation. And though I have rubbished the current plan for the BRT tunnel as one that “needs to die an unholy death”, it’s a concept that’s not entirely without merit. For example, it would greatly enhance the ability for buses to throughroute, effectively joining 2 bus lines that enter the CBD from opposite ends, halving the number of vehicles required to operate the same number of services and providing passengers with greater cross city connections. It could also provide additional space for bus interchanges, and place them closer to train stations to make multi-modal trips easier. It seems almost a no brainer to use the platforms at Wynyard Station previously used for trams crossing the Harbour Bridge and terminating in the CBD, but converted to handle buses now crossing the Bridge. Where the BRT tunnel falls short is that Infrastructure NSW has clearly come up with this idea to convince the government to trash George St light rail, rather than because it fits into a bigger picture of transport planning, like the idea that there are multiple North-South transport spines through the CBD. While the BRT tunnel will primarily ease congestion on the Western spine of Clarence and York (NWRL) and converting long haul M2 buses into feeder buses, followed by a second Harbour crossing to increase capacity. 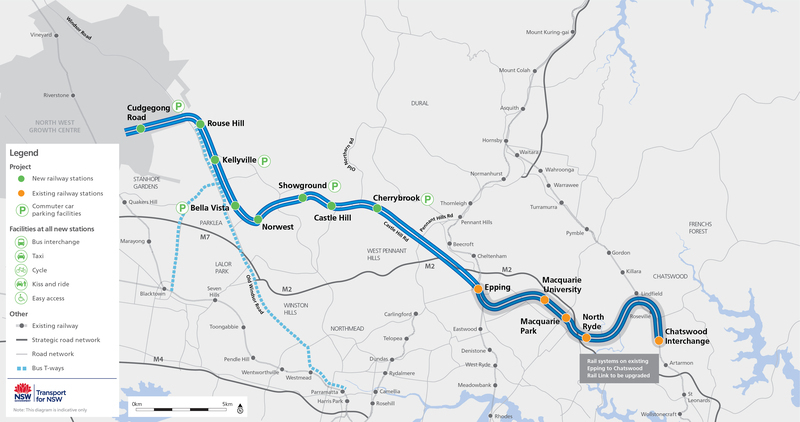 It should come as no surprise that Infrastructure NSW also opposes this second Harbour crossing, but given that the NWRL will be built and therefore make the Harbour crossing the bottleneck on the network, the question over a second Harbour crossing is now when, not if. Should the BRT tunnel be built instead of light rail, then it will improve transport connections on the Western corridor, but do little for the other corridors. Meanwhile, the tunnel will also use up the metro Pitt corridor, one of two corridors through the CBD which has been preserved for a future heavy rail line, severely limiting any future expansion of Sydney’s rail network. In addition, it will also shut down Town Hall and/or Wynyard Stations while the tunnel is being built. Ironically, Infrastructure NSW seems to show great concern at the disruption that shutting down George St (one of many streets through the CBD) would cause to motor vehicle traffic, yet has few qualms with doing the same to the 2 busiest stations in the Cityrail network (or to avoid a second Harbour crossing). Light rail is by no means perfect. It will probably be slower than many predict (albeit faster than the slow crawl of buses we currently have at peak hour). But it is the option that has been studied, and it is the option that the transport department believes best fits into the big picture of its citywide transport plan. That is why cabinet should support the light rail option, and commit the BRT tunnel idea to Transport for NSW for further feasibility study. The Transport Minister, Gladys Berejiklian, announced yesterday that the trial of Sydney’s new electronic ticketing system, Opal, will begin next week on Friday 7 December on the Neutral Bay ferry route. This will be followed by the Manly ferry in the second quarter of 2013, with all ferry routes to be Opal compatible by the end of 2013. The Cityrail network will come next, starting with a trial on the City Circle in the second half of 2013, then buses and light rail. Opal will be fully rolled out by 2015. Transport for NSW has made a video outlining some of the features, which is included below. Yesterdays announcement included a number of new details on how Opal will function. Fares will be capped at $15 per day, or $2.50 for Sundays, and all trips after the 8th are free each week. Commuters will need to “tap on” when they board and “tap off” when the disembark, and failing to do so means they will be charged the maximum possible fare for that journey (no tapping off is required on the Manly ferry as there are only 2 stops and so the second stop is assumed to be where passengers tap off). This suggests that Opal will be a point to point system for calculating fares, but it remains to be seen what the multi-modal impact will be (e.g. when you catch a bus and a train as part of one journey) and whether you will be charged a single fare for the trip or are penalised with two individual fares (resulting in a higher overall fare) for each leg of the journey. Given that Opal will be restricted only to ferries until mid-2013, it might be a while before this becomes apparent. Only adult Opal cards are available at the moment, with various concession Opal cards to be introduced in future, each distinguished by different colours (the adult Opals are black). There will also be non-reloadable Opal cards to allow single trips, for occassional users and tourists, which suggests that the magnetic stripe tickets will be phased out quite quickly and that Sydney might avoid the teething problems that Melbourne had with its simultaneous operation of Myki and Metcards. Transport for NSW staff will be signing people up to Opal at ferry wharves, with no word yet on whether it costs anything to buy an Opal card. Opal credit can be added at shops (like those where you can currently buy pre-paid tickets), over the phone, the internet (once the http://www.opal.com.au website goes live), or an automatic top-up (similar to e-tags). It remains to be seen whether the cautious trial approach that the government is taking is a good one or not. My gut tells me that it’s the right move, and will allow any glitches to be ironed out early without it negatively affecting commuters heavily. That’s the reasoning behind starting with ferries, and even then just the one ferry line at first. And while Opal was set in motion by the previous Labor government, this was a government that started 2 electronic ticketing systems but delivered none. It will be the delivery of Opal that this government will be judged on. If they want to be truly successful, then they will use this as an opportunity to introduced integrated fares as well as integrated ticketing. A funny musical cartoon has been doing the rounds on the internet about passenger safety on trains. It’s by Melbourne’s train operator, Metro, and at the time of writing had over 9 million views on YouTube. As I’ve described earlier, humour is one of the best ways of getting through to users of public transport, who generally tend to be quite dismissive and cynical about public transport. While Metro’s campaign seems to have been successful, another recent campaign by Queensland Rail in Brisbane that allowed the public to create their own etiquette posters soon turned into a meme where people would create satirical posters mocking the original concept. The recent Infrastructure NSW report correctly states that 93% of motorised transport is on roads (page 77), and concludes from this that funding should go primarily to roads (it includes buses in the 93%, as they travel on roads). Yet another way of looking at it is to look at the share of trips by cars (both drivers and passengers) of total trips, and in that case only 68% of trips are by private car, the remainder being mostly 11% on public transport (buses and trains) and 18% walking (Source: 2010/11 Household Travel Survey). A better way of measuring the relative importance is to look at the total distance by mode, in which case cars represent 79% of total passenger km, while public transport is 16% of passenger km. Dempster: You’ve surrendered to our dependency on the car. There’s no attempt by Infrastructure NSW to facilitate a paradigm shift to double public transport usage to decongest this city. Broad: 93% of movements are on roads today. I don’t see that changing a lot given the nature of our city. Dempster: You’re not even going to try to change it. Broad: And secondly, I’ll make the point, I’ll make the point we’re very pro-buses. As many people get on a bus, which runs on a road, as get on a train. Buses are a very effective means of public transport, often the poor relation to much of the public transport debate. Mr Broad’s report does support buses, but buses cannot handle the sorts of capacities that rail can, particularly over longer distances. That’s why the total passenger km for rail in Sydney is over double what it is for buses, despite the number of trips for buses and trains being about the same. This is because the average train trip is 16.7km, while the average bus trip is only 6.7km, so to compare just the number of trips does not show the full load carried by each mode. In addition, transport is something where building supply creates its own demand. By building more roads, it also builds demand for them. 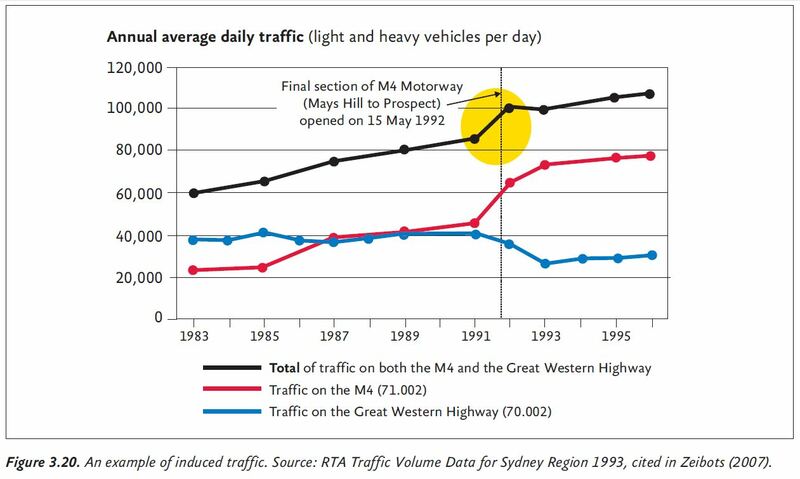 This is illustrated by the graph below taken from the Herald Independent Transport Inquiry, which shows how the completion of the M4 between Mays Hill and Prospect created what’s known as induced demand – demand for driving that was not previously there. The Infrastructure NSW report provides the counter argument (page 80-81) that new roads are in fact needed to keep up with growing demand, and that building these new roads is merely unlocking that demand which was already there, but being held back by congestion and slow travel speeds. They are not, it argues, designed to reduce congestion or increase speeds. But given the higher capacity of public transport, a better way of providing this additional capacity would be to entice a modal switch from car to public transport, thus freeing up existing capacity. Nor is it guaranteed that demand for roads will continue to grow. Infrastructure NSW points out that it is currently forecast that 4 million additional trips per year will be made in 2031 compared to 2011 (age 81). Of these, 73% are from cars (drivers and passengers) while 7% are from trains and 3% from buses. It uses these figures to argue that a Second Harbour Crossing is not needed, and so should not be built. However, looking at number of km travelled, rather than trips, then the proportion by cars drops to 64% of the increase, while public transport’s share of the increase jumps from 10% to one 32%. Not only that, but these assume that no Second Harbour Crossing will be built! Infrastructure NSW is therefore merely peddling a self fulfilling prophecy. Despite this, the government’s marquee road project: the West Connex, is on balance a good idea. It has been designed in a way that minimises the cost (by using a slot rather than a tunnel for the M4 East), while maximising the contributions to the project’s cost (through the collection of tolls and potentially value capture of the increase in land values along the corridor). As a result, the road can be constructed with an estimated $2.5bn contribution by the government, despite the $10bn price tag. 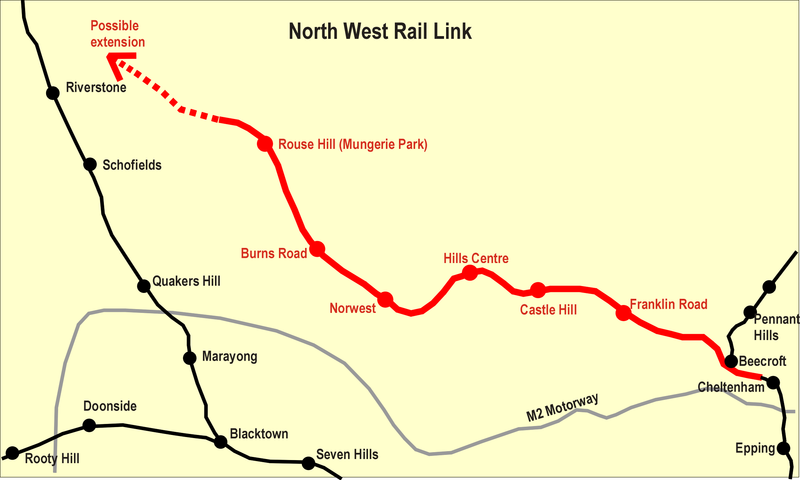 It also provides capacity for the sort of trips which are best made by cars: to non-activity centre destinations (West Connex does not connect up directly to the CBD and parking spaces there will remain unchanged, so car drivers will not be encouraged to drive in) and off-peak trips (both the M4 and M5 remain congested during the off-peak hours, as well as peak). The real problem with West Connex is if the government is forced to take on the traffic risk, away from the private sector. If this is the case, and traffic volumes are not as high as predicted, then the cost to the government will blow out beyond $2.5bn, and put other projects at risk, particularly public transport projects.